My children’s school community has been left reeling. It’s been a particularly hard year in terms of grief and loss at this school. Of course, the cycle of life is inevitable and loss of any kind is hard to bare and grief is a long and painful journey. But in this year alone, there have been a number of deaths that have shaken our very foundations, tragic deaths that somehow seem to defy the cycle of life and feel just wrong in every sense – the death of a child, the deaths of young parents and unexpected deaths. These families are left bereft and faced with the unimaginably painful task of having to live with their tragic loss every day and finding a way to move forward one step at a time. Our hearts break for these families. As adults, we struggle to make sense of these deaths and for many of us we simply cannot. These deaths obviously also affect our children. They may hear things on the playground or they may be friends of the children whose lives have been directly devastated by the loss. We cannot protect our children from these harsh realities but we can try and manage how they grapple with these losses. These are some thoughts on how we can sensitively and consciously communicate painful realities to our children. This is generally the best policy when it comes to sharing important things with children. When there is more clarity and honesty about what is happening or what has happened children are in a better position to feel safer. As parents and adults, we rather want to explain what we can to our children. We don’t want to leave them to the limitless possibilities of their own imaginations and the murkiness of some playground discussions. Whilst honesty is the best policy, it does come with a couple of caveats. Firstly, respect the family that is directly impacted by the tragedy. Rather defer to what they may be telling their children and the timing of when they are telling their own children before telling your child everything. This may mean holding back on certain aspects of the truth. It’s ok to say things like, “We don’t know the full details but this is what we know for now.” Secondly, take into the account the age of your child and use age appropriate language as well as providing age appropriate details. The older your child, the more detail we can communicate with them but always do so considering who they are. Just because they are older does not necessarily mean that they can ‘handle’ things better. Allow for and encourage questions. Try and have the self-compassion that is needed to recognise that we don’t have all the answers to all the questions. Saying things like, “I know it’s hard but sometimes we really don’t know” is preferable to providing unsatisfying and inauthentic certainty. Know that questions often come later, they may not happen when we have the initial conversation. We need to be open to knowing that we may need to have these conversations repetitively, that’s important, that helps our children process difficult things. Children need to know that its ok to ask questions whenever they come up and that they will not be judged on needing to ask anything. 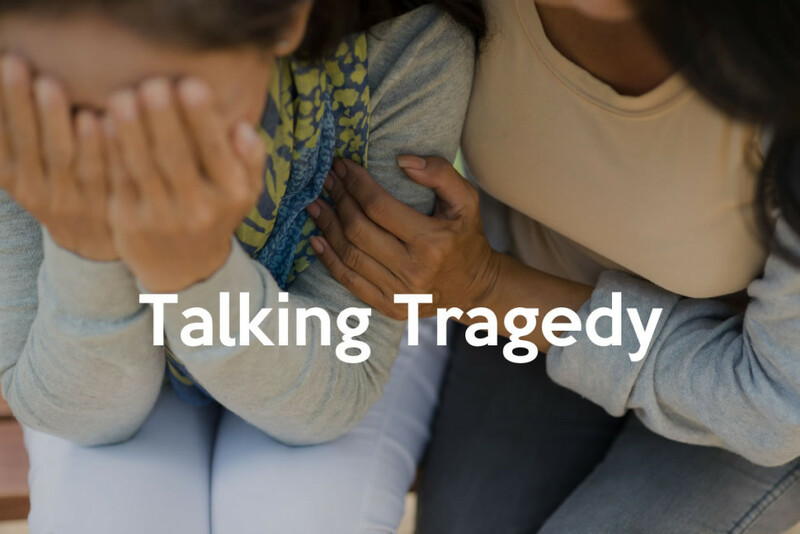 We need to be cognisant, as with most things, of trying to find a balanced approach in how we talk to our children about tragedy – we neither want to speak too little or too much about it but it needs to be acknowledged and it needs to be spoken about. We often forget that children are children and that they are continuously learning how to relate to others. We sometimes equip them with new knowledge and then take it for granted that they will know what to do with what they have been told. Often they don’t know. The result of not knowing is that they feel ill equipped and they may handle the information they have been told insensitively. We need to equip them. We can explain to them that knowing this information doesn’t mean running around and telling everyone. It means that they can talk to their friends about it if they want but to remember that these are sensitive things they are talking about and it is not for them to spread the information. We can remind them to be kind. We can give them options of things to say to their friends who are grieving so that they have something to say which acknowledges what has happened. We can remind them that its ok to have fun with their friends, that its ok to still be happy even in the face of such sadness. When tragedy occurs, it rocks our world and the closer we are to that tragedy, the more brutally our world is rocked. We must find ways to manage our own responses to grief and tragedy. One of our core tasks as parents is to keep our children safe. Tragedy has ramifications for how we think we can continue to fulfil this task. What we can tell our children is that its ok to have whatever feelings they may have. Confusion is both expected and understandable. We can help our children to feel safe and loved by telling them and showing them that they are loved and safe without diminishing what has occurred. We cannot promise them that nothing bad will happen again because the truth is bad stuff happens all the time. But we can help them to see the love and support that is there. We need to teach them both how to give love and support but also how to access these crucial aspects of life. As much as we would want to, we cannot shield our children from the tragedies of life. What we can do is try and raise resilient, kind, emotionally intelligent children who feel more equipped to manage the sometimes joyous and sometimes devastating realities of life.